It started as mere curiosity. A detail. I would whip by in either direction, trying to beat my best pace, the rain, my baby’s bedtime. It could have just as easily blended into the background, but I’m a sucker for spontaneous interventions. The entire Rail Path has developed over the years since I moved to the west end from St. Jamestown. Murals in back alleys were replaced by native plants. But as the path extended north, steel structures grew along the edges. 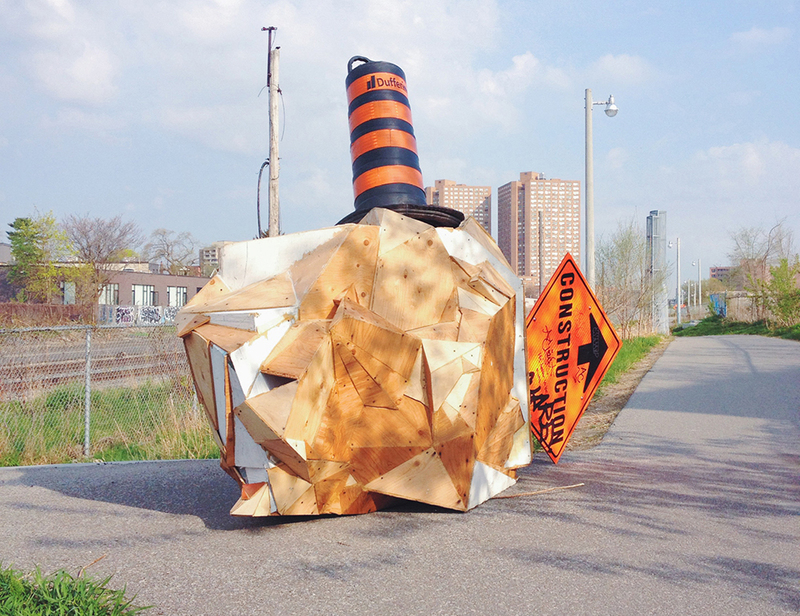 Then came the construction for the Pan Am Games – a new GO station, and with it a protective plywood canvas. Aerosol cans in the hands of artists from miles away and the immediate area started to fill it in. Then whitewash. Then an explosion of portraits and symbols. The murals became too beautiful to hide – and too frustrating. They were left to stand, to colour the neighbourhood and tell their stories. Then one day it showed up. Built out of scraps and off-cuts; fragmented and geodesic – of the same materials that hid the construction further north. Its patterns moved in unfamiliar ways. Pristine, soft and sharp. But that wouldn’t last. Soon it was adorned with pedestrian signatures; commentary stretched across its surface like cheap tattoos. And not unlike the murals, it never asked for permission. The way you do things is part of your politics. Like the sculpture of a tradition long since extinguished, the skewed effigy waits to burn. This brought to mind images of forgotten monuments. In many cases forgotten by the very people for whom they were built. “Just remember,” they whisper. But we can’t be bothered. We move past, not knowing who put them there, or what the sacrifice was all about. To us, they are just a point of reference, a nice patch of shade, or a place to find our lost forebears. But this one was never dedicated in the first place. It stood for itself. Weeks’ worth of scribbled messages added levels of intrigue. “The gallery is where art dies.” When early morning stupors knocked it down, night terror runners pulled it upright. By day it stood watching, rather stoically, over all of the strollers, cyclists, construction workers and retirees. And by night, in a neighbourhood hardly waiting to be gentrified, it could handle the storm. That’s when I began searching. Because, what else was there to do? Who put you here? Neoism, the black spray paint suggests. Are you someone’s practical joke, or grand contribution? A pile of junk come to life? The more I dug, the more I wanted it to be a pretty piece that creates wonder because we can always use more wonder.